I haven’t used store-bought dressings in years. Why would you want to buy something that is so easy to make right in your kitchen? I’m a big fan of vinaigrettes and usually whip one up featuring the current seasonal fruit. 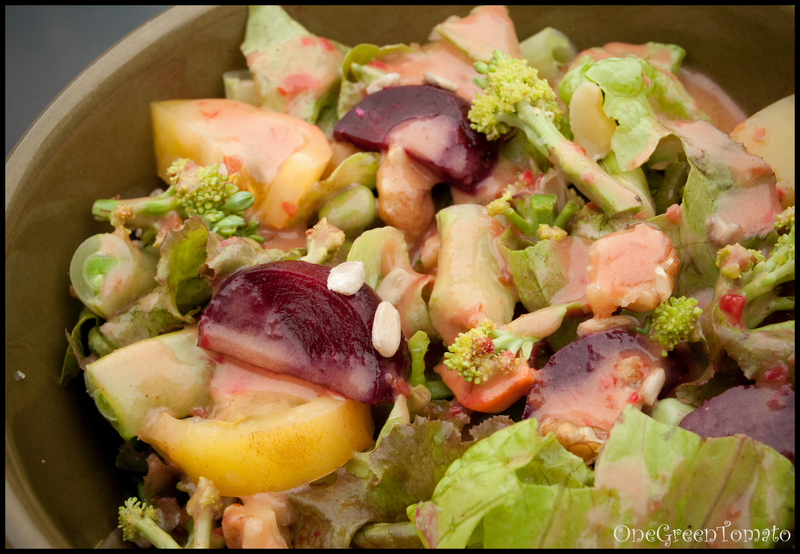 Since cherrypalooza has been taking place in my kitchen it only seemed appropriate to dress my summer salad with a sour cherry vinaigrette! Sour Cherry Vinaigrette This is my go-to base when making any vinaigrette. 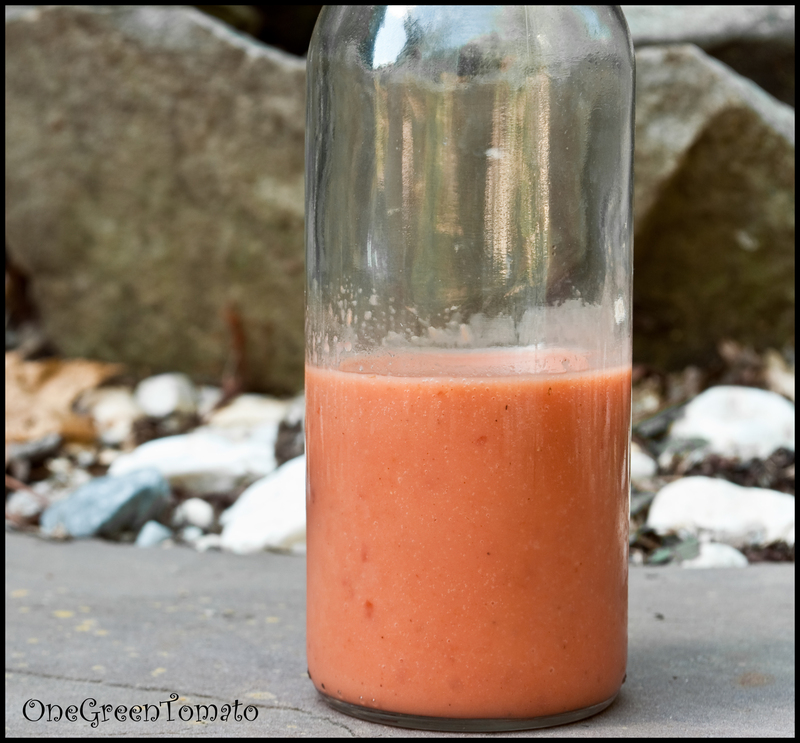 Place all ingredients in a tall container and puree with an immersion blender. You can also combine everything in the bowl of a food processor. If you don’t have either, chop cherries into very small pieces and whisk everything together. Store any unused dressing in the fridge for up to 5 days. I’m down to the last of my home-grown salads for a while. The one pictured above consisted of flame lettuce, broccoli, cream sausage tomatoes, carrots, peas and beets. I sprinkled on some feta, walnuts and sunflower seeds too. I’m going to seed some of my large containers with Tom Thumb lettuce. I never do well container gardening since they dry out so fast, but I’m going to give it another try. Tom Thumb is pretty heat tolerant, so if I position the containers where they only receive morning sun they may be okay! I just have to try this recipe, I love sour cherries, absolutely love them, then others sweet cherries are ok, but nothing makes a better pie than sour cherries and so I am sure I would love this! As I mentioned in my post, I too am a big fan of sour cherries! The vinaigrette is very tasty; you won’t be disappointed! Sounds good. Over the last couple weeks I’ve been trying to figure out how to use up about 18 pounds of sweet cherries. So far I’ve made cherry vinegar, apple cherry crumble, dehydrated cherries, and even fed a few to my chickens (they love them). I’m planning on making cherry jam and cherry shrub. Have you thought about dehydrating some? I love snacking on dried cherries and they are a great addition to granola!